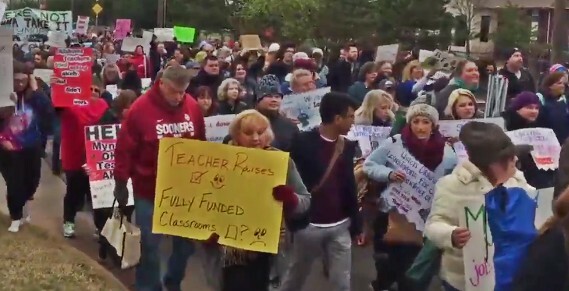 OKLAHOMA: Tens Of Thousands Rally In Support Of Teachers Walkout Over Public School Funding [VIDEO] - Joe.My.God. Thousands of Oklahoma teachers are descending on the Oklahoma Capitol on Monday in the first day of what could be an extended teacher walkout. Early Monday afternoon, Tulsa Public Schools and Broken Arrow Public Schools were among those announcing they would shut down again Tuesday in support of the teacher walkout. By 9:15 a.m., a continuous line of teachers, three to four people wide, was circumnavigating the Oklahoma state Capitol protesting the state’s funding level for public schools. After weeks of buildup, more than a hundred of school districts across the state were shut down as educators followed through on their promise to walkout of the classroom if their demands for higher pay for teachers and support personnel and increased common education funding weren’t met.